The Faculty is renowned for its world-famous Foundation and Diploma-level Modules, made accessible through various methods of study. Students can choose from attending London Classes, enrolling in Distance Learning via Email, completing full- or part-modules (as offered) at Summer School, and for those working on the Foundation Course – engaging in interactive Online Classes. In addition, we run a range of Online Seminars which are open to all. These courses provide additional teaching to registered Faculty students as well as offering a way to engage with the Faculty on a more casual basis – perfect for those who do not want to commit to study a whole Module. Periodically we also co-facilitate courses in locations around the world. Read about New York 2018 and our past programmes in Bali, Goa, and China. The video below features Faculty President Cat Cox and gives an insight into studying the Foundation and Diploma Courses with the Faculty and answers some of the key queries that new students ask us. Whether you are studying for your own personal development or with a view to becoming a professional astrologer, the Faculty’s Foundation and Diploma courses provide a complete, comprehensive and thorough astrological education. 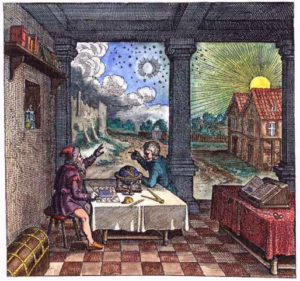 Our course material is unique – we have a philosophical but practical approach to the art and craft of astrology, preserving its rich traditions and at the same time embracing and including modern psychological and post-psychological thinking. Our course material is constantly updated, providing thorough, in-depth and comprehensive guidance to help you understand and work with astrology, from basic principles to the inclusion of a wide variety of techniques and from basic chart skills right through to intermediate and advanced levels of astrological interpretation. *There is an additional £ 35 one-off registration fee when you first enrol. Each module is supported by an abundance of written articles, available to distance learning, classes and Summer School students, which cover each subject in depth, offering practical examples and case studies to illustrate. The course material builds into a comprehensive library of written material, guiding your studies and offering ideas for further reading. The Foundation Course contains modules 1-3 and is designed for complete newcomers to astrology as well as those who wish to consolidate their previous knowledge and reading within a structured course. The course aims to provide you with a basic understanding of the language of astrology and the ability to interpret a birth chart with some degree of competence. Level 1 contains modules 4-6 and aims to extend and deepen your skills. You will be encouraged to develop an imaginative and sensitive approach to chart interpretation and to address the ethics of good practice. 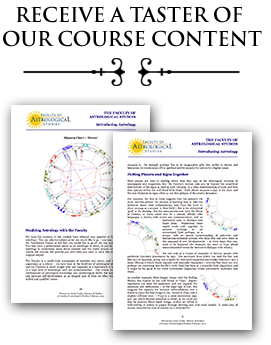 You will learn to interpret a natal chart as it develops over time, incorporating transits, solar returns, secondary progressions and more into an integrated interpretation. Level 2 contains the final 3 modules that we offer. You will be introduced to the theory and practical application of the astrological techniques of midpoints, harmonics and synastry. You will learn about world astrology, the relationship between the individual and the collective, astro-geography and relocation, as well as electional astrology. The Faculty’s courses offer flexibility and choice. Our modules can be studied through Distance Learning via Email and at classes and seminars in London. From October 2018 our Foundation Course will additionally be available as a fully online course. A selection of full and part Diploma modules, along with Module 3 of the Foundation Course, can also be studied at our annual Summer School. You can choose whichever method of learning suits you best, and alternate freely among them, module-by-module, to suit your individual needs. Maximum flexibility is built into the modular structure, enabling you to enrol on each module when it suits you, to spread the cost of your studies, and to take a break between modules if you wish. Modules 4, 5, 7 and 8 are even available as a series of part-modules, allowing you to take a break mid-module and further spread the fees and the work flow. As a Faculty-registered student, you will have access to our Faculty Facebook group and become a member of our global astrological community, able to chat to other students whenever you wish and no matter where you are in the world. We also offer three practice interpretation modules, related to the Certificate, Intermediate, and Advanced exams. For further details on these please see the Examinations page. Studying by Distance Learning via Email offers you the freedom to enjoy a flexible study schedule to fit around your life. You can choose to study at home, at work, on the move, in fact anywhere that suits you. With email Distance Learning, there is no requirement to commit to specific days and times. Alternatively, our Foundation Course is also available as a fully online course. 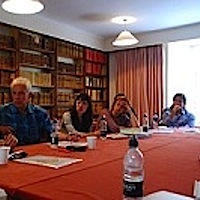 The Faculty’s London classes programme is held each academic year at a venue in Central London, which is easily accessible from most parts of the UK and continental Europe. Many students choose to study at live classes because it offers the opportunity to meet like-minded people and to learn from the experiences and examples of other students. 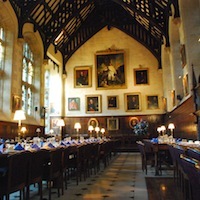 The Faculty’s annual Summer School is one of the world’s best-known astrological events, attracting students from many countries to the beautiful city of Oxford to enjoy the weekend courses and five-day courses. The programme caters for a range of levels, from relative beginners through to students and practitioners at advanced or professional level.